Cedar City is near the borders of the Great Basin, the Colorado Plateau, and Utah’s largest volcanic complex. Arches, which exist in a variety of geologic formations in this area, exhibit some of the region’s geologic diversity. Cedar City generally is not known for hosting arches, yet within a 30-mile radius there are more than a dozen arches. Described here are five of these features. Mitchell Arch is eight miles north of Parowan (northeast of Cedar City), located in section 23, Township 32 South, Range 9 West. The arch is on Bureau of Land Management land and can be reached by a short hike from a jeep road west of the Kane Springs Road. The area contains ash flows from the Tushar Range to the north; Mitchell Arch is in an eroded section of volcanic ash from the Leach Canyon Formation, and spans 32 feet and is 7 feet high in the center of a 60- foot-long rock fin. Hole in the Wall Arch, locally referred to as Timpe Arch, is four miles south of Parowan in section 35, T. 35 S., R. 9 W., on the west side of Parowan Canyon (Route 143) on Dixie National Forest land. 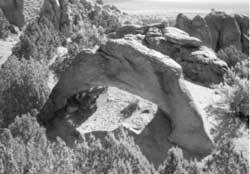 The arch can be seen from southern Parowan, and can be reached by driving up a jeep road west of the arch and scrambling up a steep mountain face. 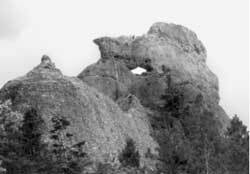 Formed in a poorly cemented section of the Grand Castle Formation (an unlikely place to find an arch because of the rock’s gravel-like composition), the arch spans about 12 feet and is about 4 1/2 feet high. Second Left-hand Canyon Arch lies four miles southeast of Hole in the Wall Arch, in section 19, T. 35 S., R. 8 W. (Dixie National Forest), on the east side of Route 143. One of at least four arches in the upper Claron Formation (pink limestone) along Center Creek, this rectangular arch has a span of 20 feet and a height of 13 feet, and can be seen from the road traveling down canyon, or reached by an easy hike. Flannigan Arch is located in Ashdown Gorge east of Cedar City in section 25, T. 36 S., R. 10 W. The tough, wet, 11/2 mile hike along Ashdown Creek to the arch begins between mile markers 7 and 8 on Route 14. The arch, which has a span of 120 feet and is 100 feet high, is a very impressive Iron County site and was recommended for National Monument status in 1918. Formed in sandstone of the Iron Springs Formation, the arch is on Dixie National Forest land. Elephant Arch is south of Cedar City, in the Kolob Canyons section of Zion National Park on the north side of the North Fork of Timber Creek in section 35, T. 38 S., R. 12 W. The arch can be seen from the terminus of the Kolob Road, or reached by hiking the first mile of the Kolob Arch Trail, then heading east towards the cliffs and along the creek until the canyon narrows. From the creek, scramble up the steep north side then east toward the west side of the arch. Located in the base of the Navajo Sandstone and the top of the red Kayenta Formation, the arch spans approximately 40 feet and is about 20 feet high. Steve Heath has taught mathematics at Southern Utah University for 30 years. He also has a masters degree in the History of Science and has a keen interest in the history of the southern Utah national parks and monuments. Much of his free time is spent hiking and exploring southern Utah.